Yamaha P-45 Digital Piano Review - Best Beginner Piano? Even though it’s a few years old, this piano continues to impress. In this Yamaha P-45 Digital Piano review I’ll help you decide if it’s right for you. 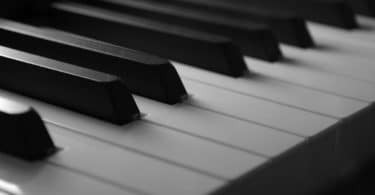 If you’re visiting this particular article, it’s very likely that you’re considering purchasing a digital piano - and it’s equally likely that you’re looking at Yamaha’s P-45 Model. Released only a few years ago, the sleek looking instrument still a top contender in its category, so you’re on the right track. In this article, I’ll discuss some of the key features of the P-45 model, and what sets it apart from other options on the market today. That way, you can avoid any potential buyer’s remorse by familiarizing yourself with the features of the Yamaha P-45. Before we dive in, let's take a listen to how it sounds! If you’re in a rush, here are some of the aspects I address in this article. It has 88 keys with four degrees of touch sensitivity, and a GHS (Graded Hammer System) keyboard, which I’ll talk about in more detail in the internal hardware section. It takes a DC 12v power input with an included adapter, has a headphone jack in the body, and features USB connectivity. Now that the boring technical specifications are out of the way, we can talk about the equally important, but more subjective aspects that go into making your decision. First of all - the P-45 has an undeniably sleek, modern appeal from stem to stern. The body and main assembly are simple, minimal and no-frills, but still retain a touch of class and style. The design is utilitarian without sacrificing aesthetics, which can be a hard line to walk. The black keys are designed with a matte finish, making them easier to play for prolonged periods, and the GHS system (we’ll get there, don’t worry!) gives the digital keys a tactile feedback remarkably similar to acoustic piano keys, which is a great feature for practicing and simple ease-of-use. Finally, the entire thing is compact and lightweight - with some of the digital pianos I’ve owned, I’ve had to lug around 35+ pounds when traveling, playing shows, or simply moving the keyboard to another room. So I appreciate the effort that went into designing a manageable size and breezy weight - The P-45 is a sight for sore arms. If you’re looking for a good carrying case, Yamaha has one specifically for this model line - you can check it out here. And if you’re really after some heavy-duty protection for your investment, and you don’t mind paying a premium for peace of mind - then Gator Cases has a seriously solid case that should keep your piano in playing condition, in any catastrophe short of a head-on collision with a semi truck. If you’d describe yourself as an audiophile or a sound design enthusiast - even if you wouldn’t do so out loud - then this is the section for you! The P-45 has a polyphony number of 64, double the previous model released by yamaha, 32. For those unfamiliar with the terminology, it’s probably something you’ve run into before - especially if you’ve been playing on digital keyboards for a while. The polyphony value is essentially the amount of unique note that a pianist can play at once. Older, or cheaper digital keyboards typically have polyphony values of 16 or even 8, meaning that if you wanted to play a scale with sustain, the first note would cut off entirely as the 9th note was played, in order to ‘make room’ for the new sound. With a polyphony value of 64, you aren’t likely to run into any issues unless you’re playing something incredibly involved. The Yamaha P-45 uses GHS, or Graded Hammer System, to better replicate the feel and action of an acoustic piano. While some cheaper models use a button directly under the key, often with 2 or 3 degrees of pressure sensitivity, the GHS system works with physical hammers, much like an acoustic piano. Instead of these hammers striking the strings of an acoustic piano, however, they instead act on the pressure sensitive mechanism inside the piano for the given key. Unlike digital sensors, this setup allows for dynamic key pressure which is heavier on the lower keys, and lighter on the higher keys, just like a real piano. And since the GHS system is proprietary, you won’t find it in any models other than Yamaha’s. The action of the keys on the default setting is a bit lighter than a “real” piano, but never fear- if you’re looking for the real finger workout of an acoustic, the sensitivity is adjustable, up to four levels- but be sure to go easy on your fingers and wrists, carpal tunnel is no laughing matter! The P45 comes with an included sheet music stand, a power adapter, and a sustain pedal. It’s a breeze to set up, and is ready to play right out of the box. By default, it doesn’t come with a stand or a stool, but Yamaha does offer a home bundle that include a rather classy looking stand and stool. The keyboard comes with 10 high-waveform sounds: 2 piano voices, 2 electric piano voices, 2 organs, 1 string, 1 vibe and 1 harpsichord. They use AWM, or Advanced Wave Memory, so the sounds are especially bright and clear. As for usability , Yamaha has taken an innovative approach - the keyboard you play on is the same you use to change voices, modes, and functions. The above picture includes every relevant button on the piano - the control scheme is intuitive once you get the hang of it, and leaves the piano sleek and modern-looking. Simply press the function key, then the key corresponding to the tone you want to use. The P-45 also includes a split, or duo mode. By pressing the function and then the D4 key (right next to middle C!) 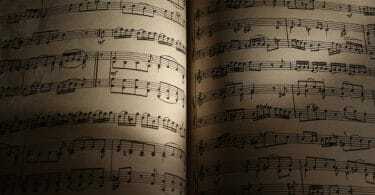 - the piano effectively splits in half, becoming two 44-key pianos. This is great for duets, or for piano teachers who want to play along with a student or demonstrate a piece. Rather than moving the student off the bench, playing, and having them switch back, or playing a piece several octaves transposed, the teacher can play the exact same notes in time with the student. If you’re torn between the two models, this section might help clear up some of the differences between the two models. The Yamaha P-115 has the same dimensions as the P-45, with the exception of an extra ¼” in height - bringing it to a total height 6 and ¼” (or, 163mm for those fans of precision) as opposed to the P-45’s 6.0”. But, the differences certainly don’t end there. 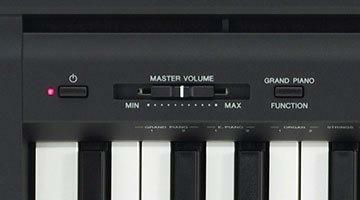 Both models are 88-key, but the Yamaha P-115 boasts a polyphony value of 192, more than 3 times the P-45. This gives you almost no ceiling on the amount of notes that can be heard, even if you were to play a piece that somehow hit every key on the piano, twice before the sustain faded. It may not be your primary concern as a player, but it is a nice feature to never have to worry about expressive pieces being hamstrung by chopped notes. In addition, the P-115 hosts 14 voices to the P-45’s 10. The P-115 also uses a different sound engine. Instead of AWM Stereo Sampling, the P-115 uses the Pure CF Sound Engine (And Pure CF sound samples). This may be a huge difference to some of the more serious audiophiles out there, especially if you’re looking for a long-term investment. While we’re on the topic of sampling, the P-115 also has a leg up against the P-45. The P-115 includes a through sample of Yamaha’s CFIIIS 9’ Grand Piano - A 9 foot, hundred-thousand-dollar behemoth created in 1962. In terms of sound quality, the P-115 has a 7-watt amplifier with two 12-centimeter speaker cones, versus the P-45’s 6-watt amplifiers, with the same speakers. However, the P-115 also features two additional 4-centimeter speaker cones. The wattage increase on the amplifier doesn’t make too much of a difference, but the sound of the P-115 is noticeably brighter and more crisp. In terms of usability, the P-115 has a companion app that can control the features of the piano through bluetooth connectivity. In addition to all of the hardware and software features of the P-45, it also allows for two additional pedals, a total of 3 compared to the P-45’s single pedal attachment. The P-115 has the ability to record pieces, a feature that the P-45 sadly lacks, although the built-in USB port can connect to a recording device or MIDI controller. It also offers the ability to cut the speakers for vocal recording without sound interfering, a great feature for home artists recording their own music. Depending on where you shop, the P-45 averages around $450 and the P-115 comes close to $600. The bevy of features included in the P-115 give it a lot of versatility and value, so I would say it’s worth the jump in price. That being said, the P-45 is still an excellent piano for beginner, intermediate, and casual advanced players, and the P-115 is a step up for serious performers or recording artists. I hope that this article has gotten you off the fence - the P-45 is a well-designed, aesthetically pleasing and capable piano, and it’s priced very reasonably for the features it offers. It’s an affordable investment if you enjoy playing, or even just want to learn.